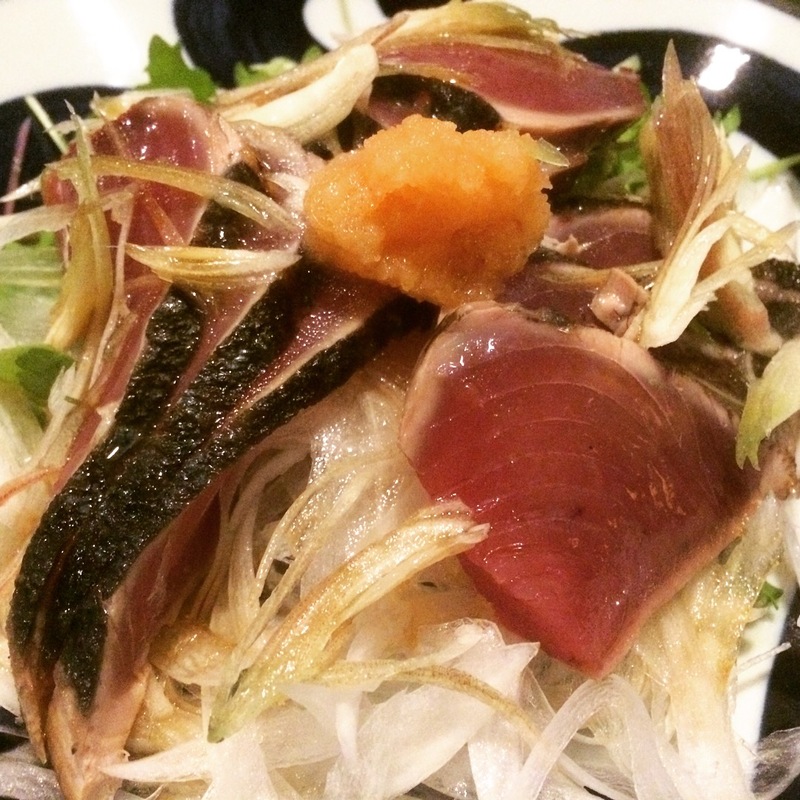 The other night Satoshi wanted to check out an izakaya near Hasunuma Station called Shake Chazuke (salmon with tea and rice). 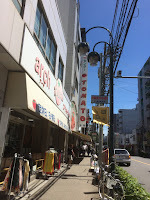 You would think chazuke was their specialty, but they have a disclaimer on the outside of their shop that they do not specialize in chazuke. In fact, I don't think I saw chazuke of any kind on their menu. 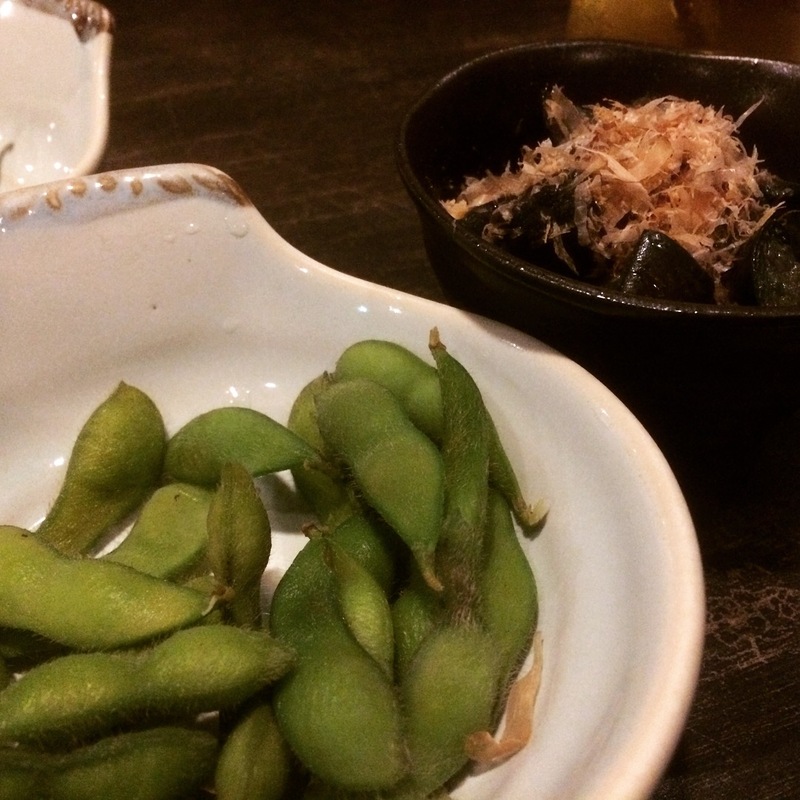 We started with the obligatory otoshi/tsukidashi (amuse bouche)...edamame and nasu agebitashi (eggplant fried then soaked in a sauce). The karaage corn was different but really good. Simply seasoned with salt and fried in oil, maybe a little butter. 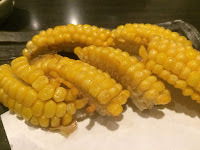 You eat the kernels off of the sliver of cob then throw the cob away. Katsuo tataki (seared bonito) salad. 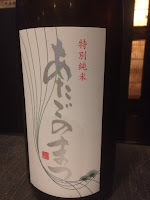 Delicious with ponzu, thinly sliced onion and thinly slice myoga (Japanese ginger). 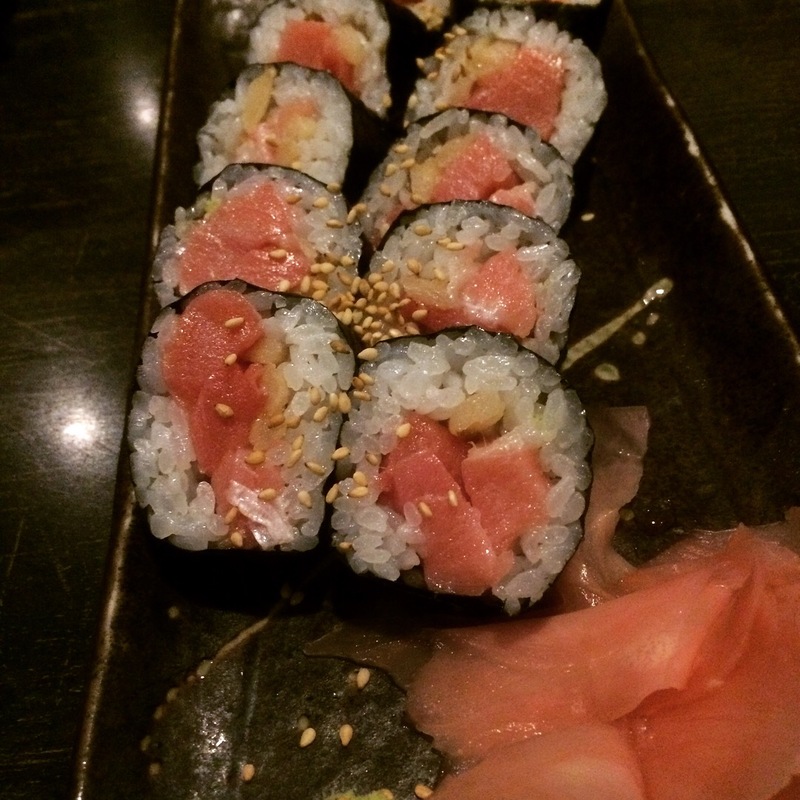 You could only order this if you got at least two orders worth. 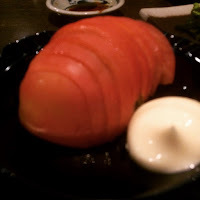 Toro (fatty tuna) takuan (pickled daikon) roll...loved this combo. 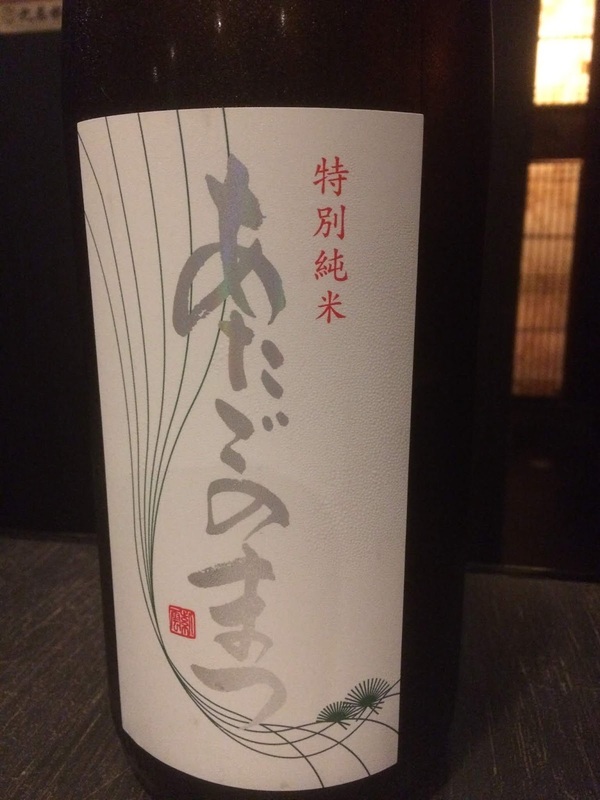 Satoshi tried this Atago no Matsu, a sake from Miyagi Prefecture. 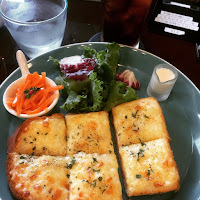 We enjoyed the atmostphere and the food was good. While I was in Hawaii, Satoshi sent me an email stating that we "had" to buy a dining room table....WT? When we moved from Osaka to Tokyo, I got rid of our dining room table because I didn't think it would fit in our kitchen area. Plus, the chairs that were with the dining table were made of cardboard that were covered with leather(?) and were starting to fall apart. Anyway, since moving we had been using our kotatsu which is a low table that has a heater built into the base of the table. In the winter, you sandwich a futon (comforter) between the table top and the base of the table. While you eat or sit, your feet are toasty from the heater and the futon also keep your legs warm. I thought it would be good using the kotatsu because if others come over, we would just need to take out another zabuton (cushion) or two. So I looked online for something with a bench that could be tucked under the table when we weren't eating. Sunday, we went to several furniture stores and decided on this one by Unico (pictured above). It's made of cheek-zai...WT? is a little larger in length than the kotatsu table we have and also has a little storage under the table as well as the benches. 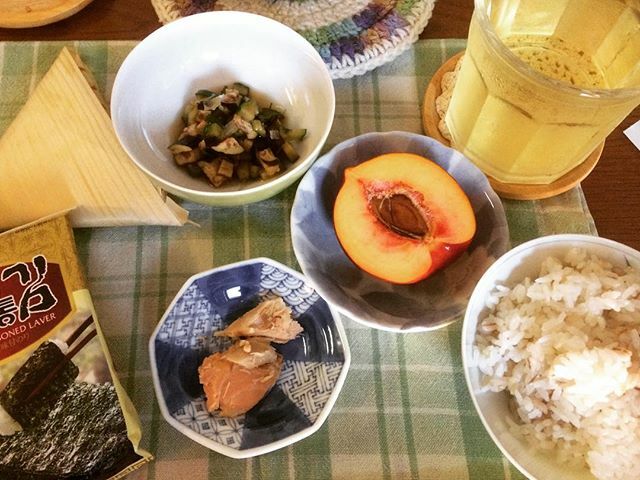 Anyway, our table and benches will be delivered next week and they will also take away our kotatsu (for a fee), which is good because I'd hate to have to deal with discarding the kotatsu ourselves. Hopefully this table will stop "someone" from moaning and groaning. Whenever we walk outside we choose the side of the street that has the most shade. Sometimes there is a slight (warm) breeze with the shade..super rare though. Most times it feels like you are in the oven, like right under the broiler element (even with my sun umbrella). The wet humidity just makes everything really uncomfortable. I've heard that there is a huge demand for ac now but not enough people to install them. Since our apartment does not have many electrical outlets, we'll need to figure out how to cool our apartment after we survive this summer. 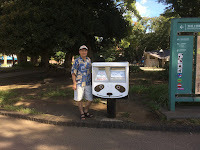 The past several months, Satoshi's been studying for a test, which I think is to get a license to be a travel guide...anyway, he took the test and is waiting for his results. Saturday, was blazing! with humidity it was even more miserable. 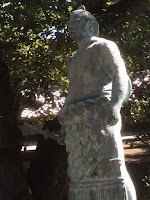 We first stopped at Ueno, where I showed him Shinobazu Pond, the flowers weren't plentiful, but the leaves still filled the pond. He was impressed with the size of the pond. A fifteen minute walk away was where I wanted to eat breakfast...Kayaba Coffee. 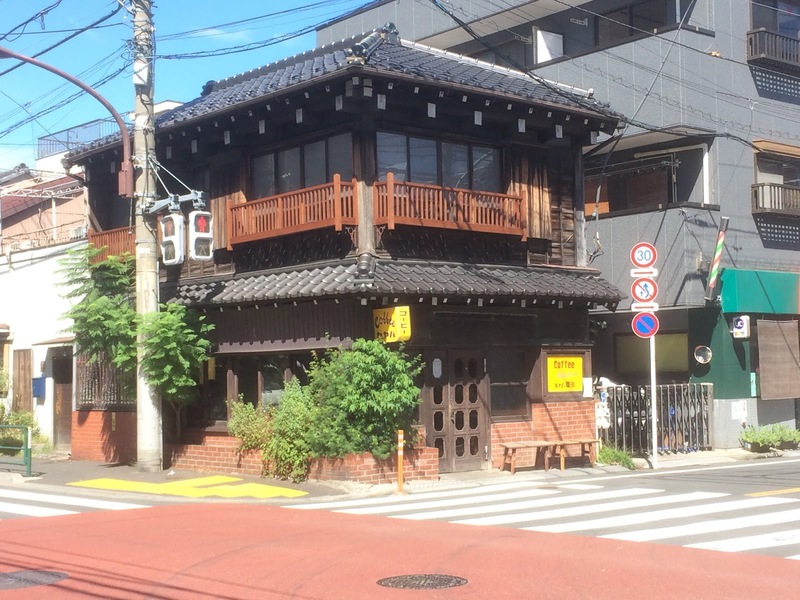 This 100-something year old machiya (traditional Japanese wooden house) was renovated into a cafe and has been in business since 1938. 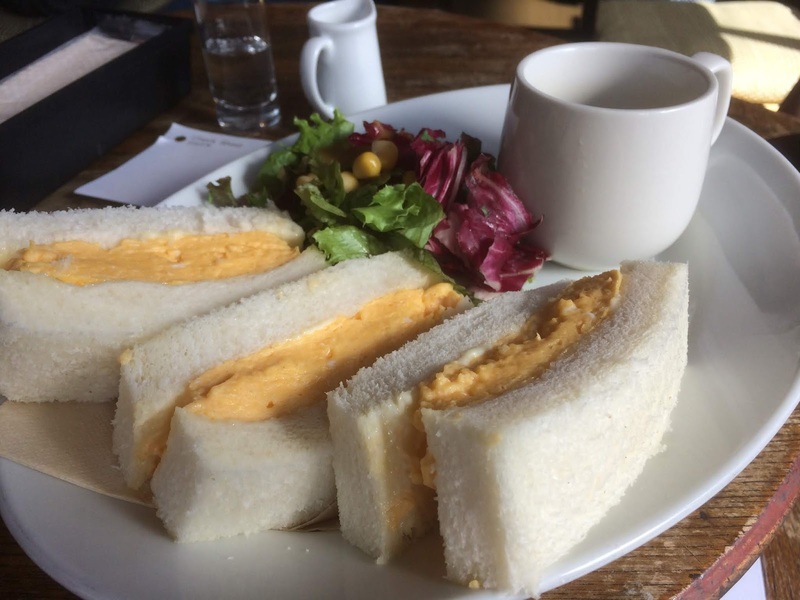 Satoshi had their egg sandwich and a coffee. 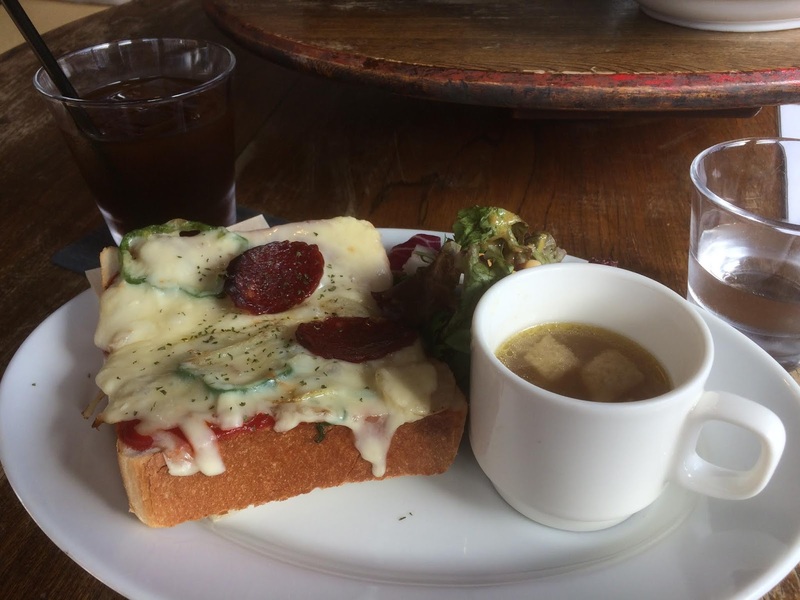 I had their pizza toast and an iced coffee. Satoshi wasn't impressed with their coffee. Dunno if we'll be back, but I'm glad we got to try them. 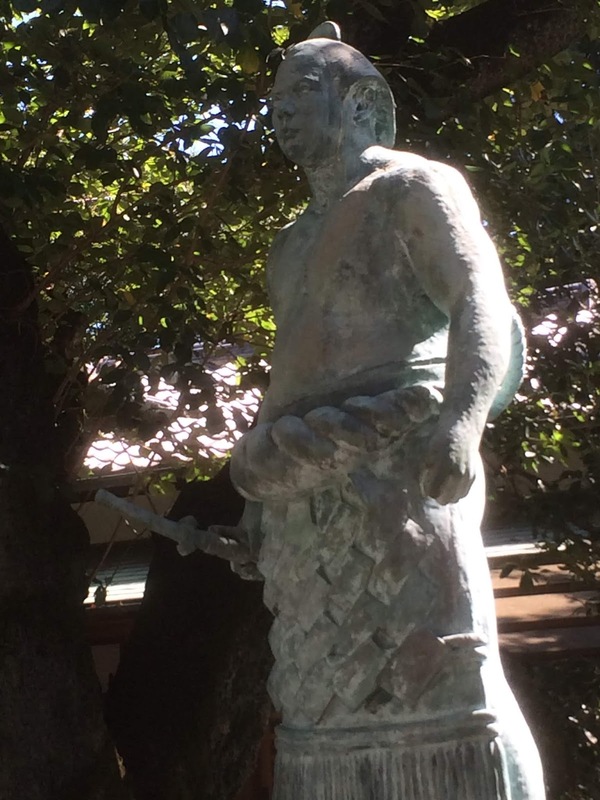 Down the street from Kayaba Coffee is a statue of Chiyonofuji, a well-known sumo wrestler on the property of the Gyokurin Temple. In the Yanaka Cemetery is the family grave of Tokunaga Yoshinobu (the last shogun). 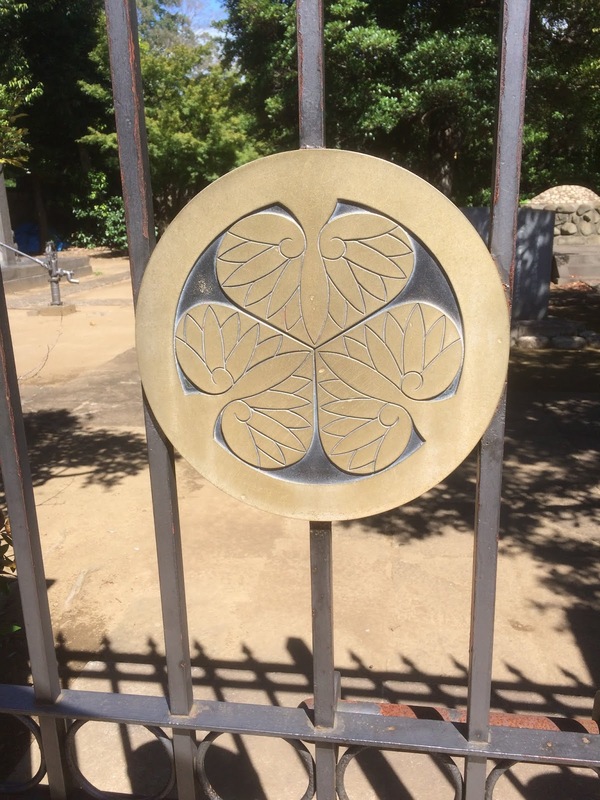 I read there are also famous Japanese artists' graves in this cemetery too. From the cemetery we stopped in at Habutae for some shave ice...totally needed, it was blazing 34C (91F) and with humidity felt like 43C (109F). 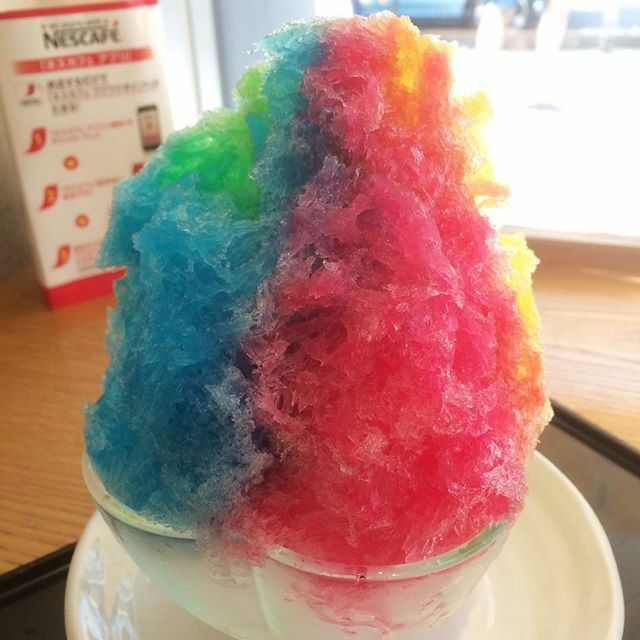 Rainbow shave ice really hit the spot. 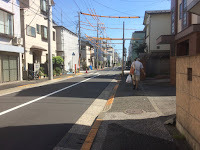 Then we headed to Fabric Town in Nippori. My aunty had mentioned that she bought some fabric there and wanted me to check out the prices for her. One could majorly spend the whole day walking around all those fabric and notion shops. 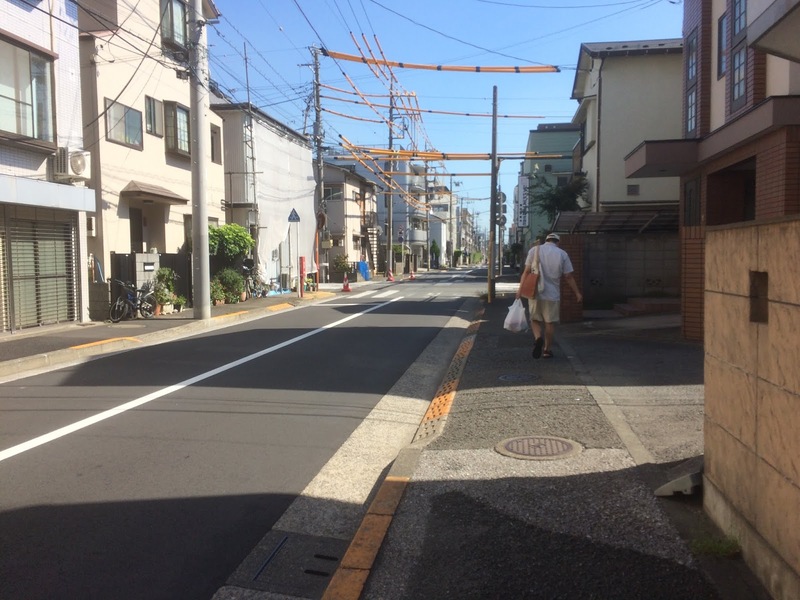 On the west side of Nippori station, is Yanaka. Yanaka Ginza is a cute little shopping arcade with lots of food and knick knack shops. There are supposedly many cats roaming around but I think it was too blazing for any of them to out and about. Stick donuts that are supposed to resemble cat tails from Yanaka Shippoya. Bun filled with chestnut and sweet bean paste and a croquette sandwich from Atom. 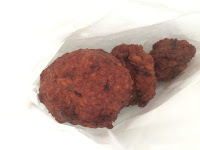 Scotch egg (hard boiled egg covered with hamburger then deep fried) and chicken and gobo (burdock) fritters from Ichifuji. Sugar coated and shoyu senbei from Yanaka Senbei. 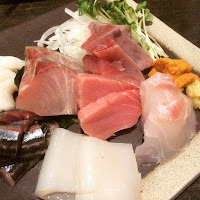 Satoshi had their daily lunch. 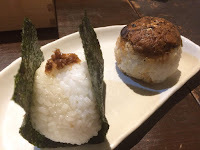 I wasn't too hungry so I had a musubi filled with ume and bonito flakes and another musubi topped with miso. I had many many cups of cold tea and enjoyed listening to the Hawaiian music they played. 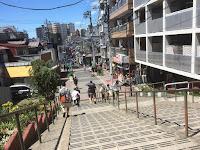 Down the street is Nezu Shrine. We'll be back to see the azaleas. 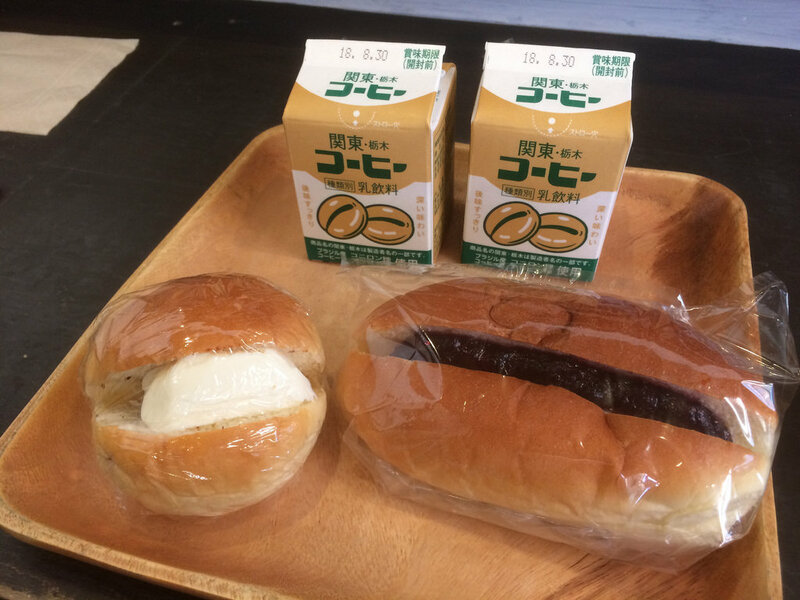 We shared a chocolate & cream filled bread and a blueberry cream cheese bread with ice cold coffee milks at Ohirasei to escape the heat. 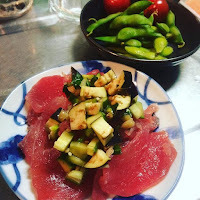 We did and ate a lot despite the miserable heat and humidity. Still, we were glad to be out and about. 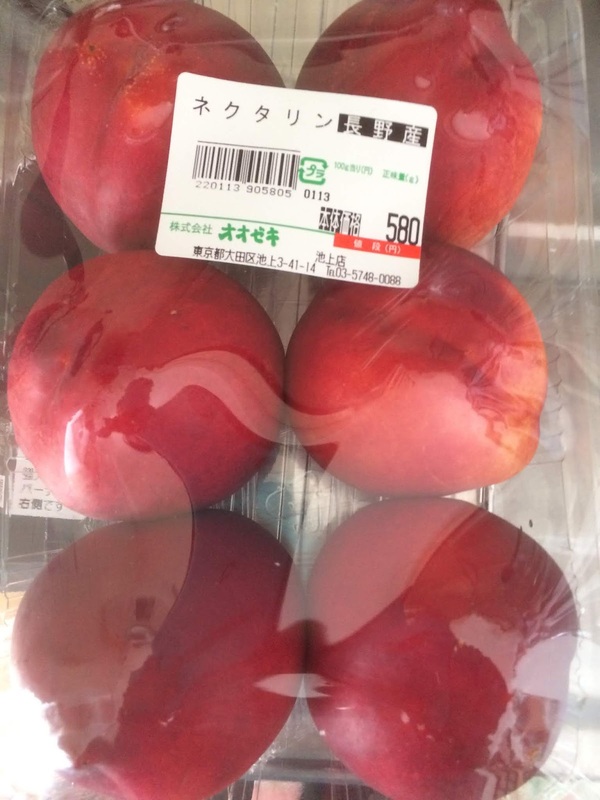 Came across nectarines at the market recently. They are grown in Nagano Prefecture. A little tart, but really juicy. I'm glad we got to try this and I hope the rest of these will be as good or even better. p.s. I'm glad to hear that Oahu didn't get hit with the hurricane, but I do hope that Maui and the Big Island will be able to make a quick recovery from all that rain. Lots of areas in Kansai were hit with tons of rain and wild winds. Rooftops flew off, metal crushed easily like aluminum cans, tons of mud and flooding...even a wind power windmill fell over...pretty krazy news footage. Luckily in Tokyo, we had some rain and winds but nothing really major...well, the heat and humidity were krazy! 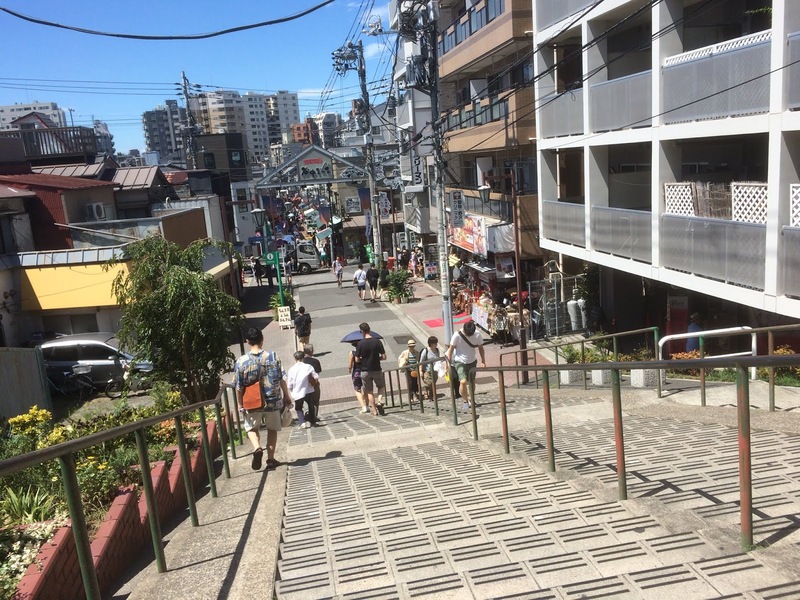 Areas in Northern Japan hit 40C (104F) because of the typhoons...eep! If I am not mistaken our typhoon season started in July and runs to November. Can you believe we've had 6 in the past week? Japan numbers their typhoons instead of giving them names and we are on 20 already! Number 19 and 20 are heading for Hokkaido...together! Because the humidity was unbearable, dinner last night was super simple, I just picked up some sliced maguro, topped it with some yamagata dashi and used the stove for 7 minutes to cook dadacha mame (which are similar to edamame). Stay safe Hawaii, have a nice weekend everyone. 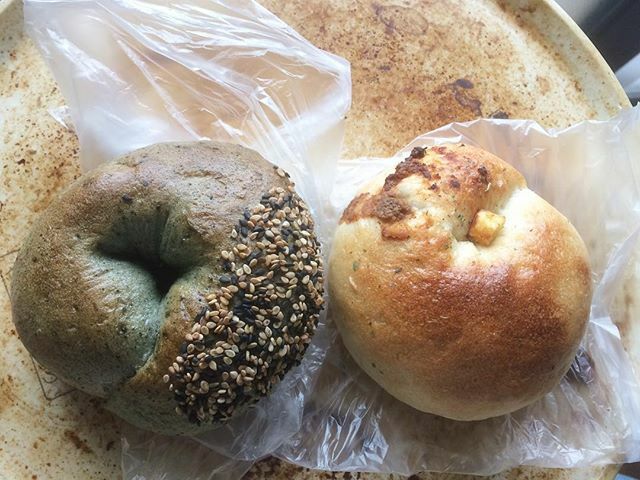 Just found out that Guru Guru Bagel, closed up shop in early August for good because the owner/baker is ill.
Hope she will be okay. 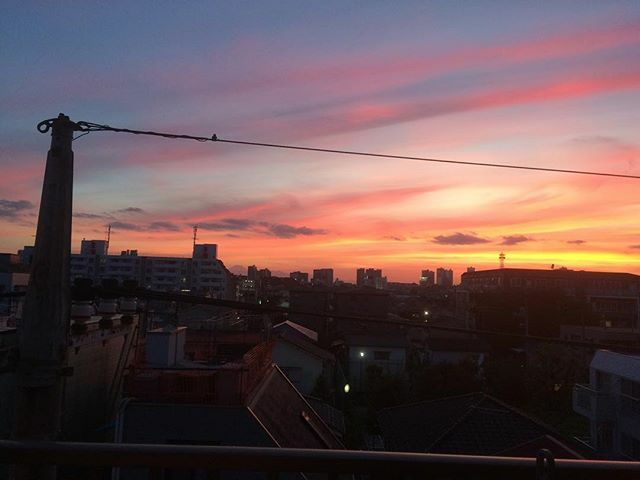 With the cooler weather over the weekend, we've been having beautiful sunsets. This one is from Saturday. Click on the photo above to see the short video. This week...the heat and humidity are back. Japan has two typhoons approaching in the coming days...I also hear that Hawaii has a hurricane approaching...stay safe everyone! 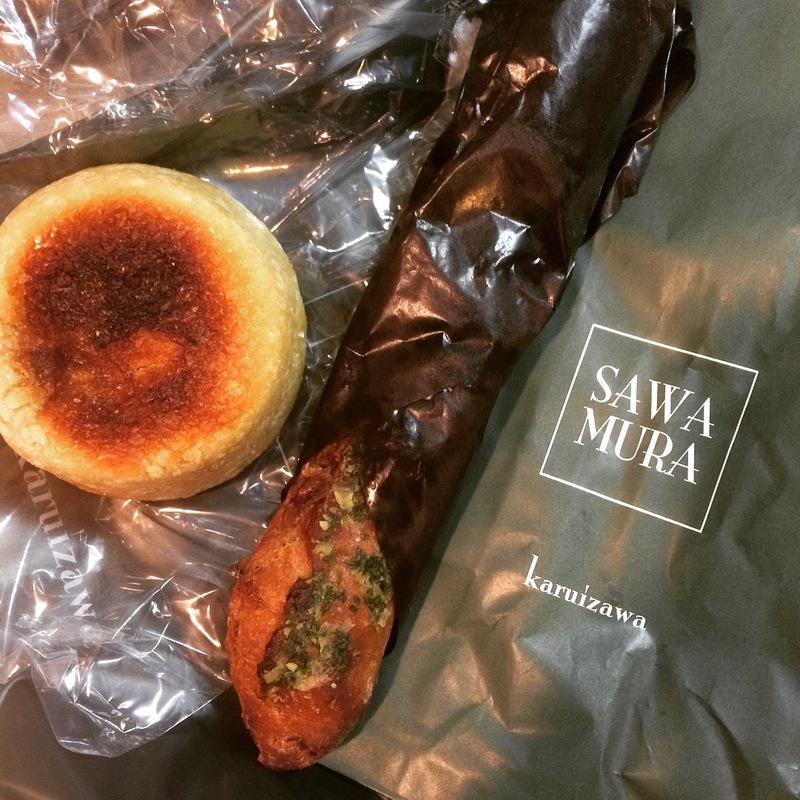 I saw a line outside of Sawamura Bakery, which apparently has their main shop in Karuizawa. 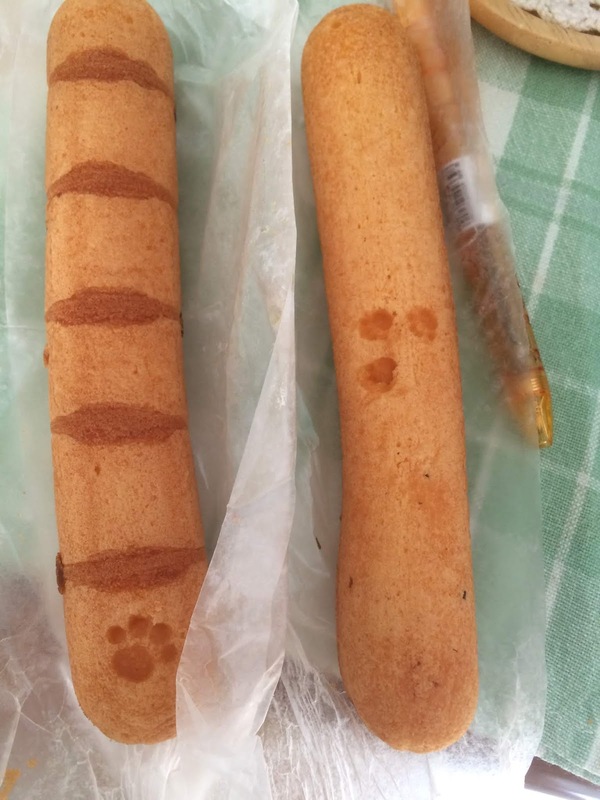 When I passed by the shop a little later the line was gone, so I went inside and picked up a garlic walnut stick and curry pan. 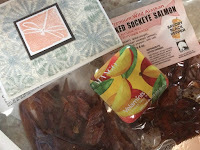 The garlic walnut stick was super buttery and garlicky. 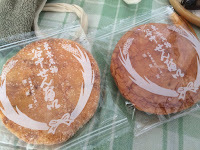 The curry pan had a thick slice of eggplant and slightly spicy curry inside. I want to go back to try the lunch menu in their restaurant. 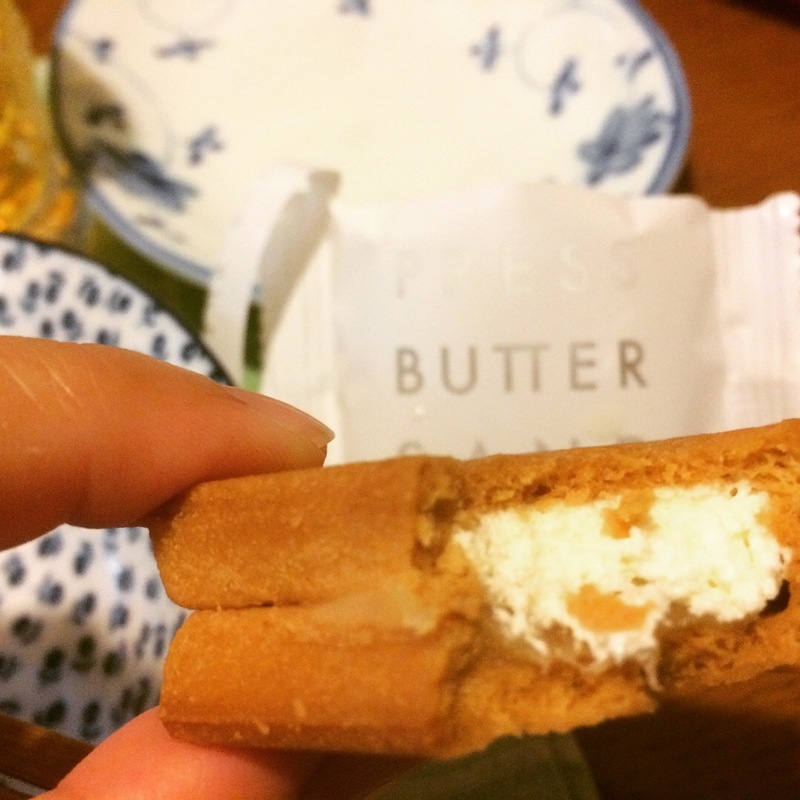 Press Butter Sand is the latest shop created by BAKE, which makes cheese cake tarts. If you remember they also have shops called RINGO...hand held apple pies. Press Butter Sand are two buttery shortbread cookies filled with caramel and buttercream. 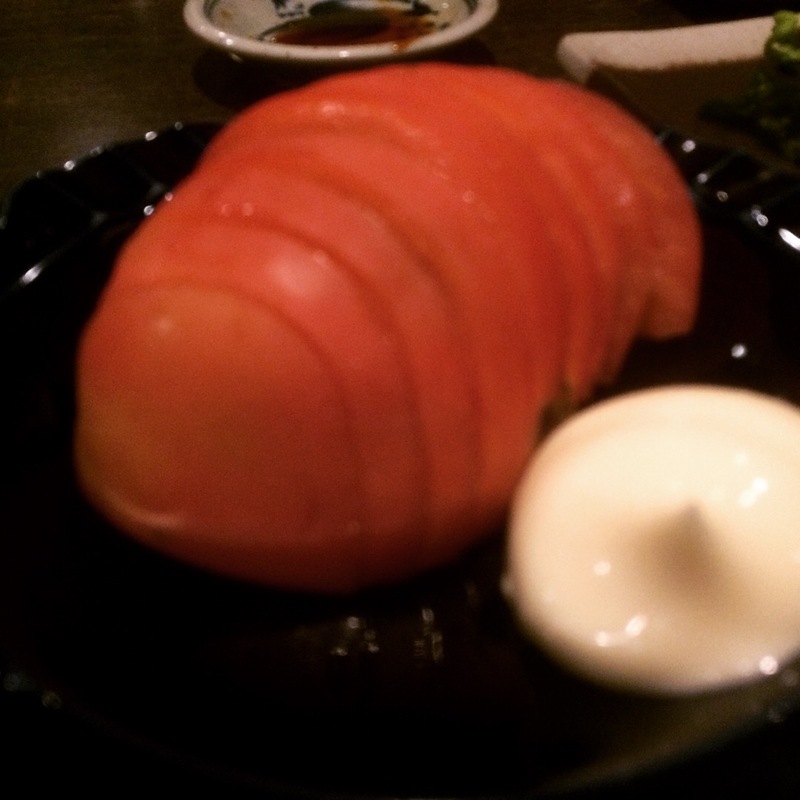 "Sand" is the Japanese way to shorten the word for sandwich. You cannot go wrong with using butter. The lines I've seen for this are krazy but I got lucky when I went to Shinjuku Lumine. 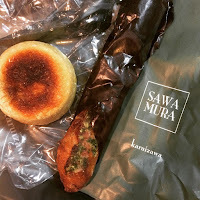 Right now, you can only buy this in Tokyo, but I'm sure it will start branching out soon. This is great for gifts. 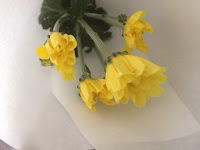 There is a tiny flower shop in our neighborhood that we stumbled upon...Misumi Flower Shop. I don't buy flowers too often, but when I do, it is usually for my mom and grandma. I like this shop because the grandpa that runs this shop is always so nice. Like the shop I used to buy from in Osaka, he always asks if I want him to cut the stem shorter. I'm glad I found a reasonable and friendly place to buy flowers at. If you are following us on Instagram, you'll know that I was able to view the fireworks for our city last night from our balcony. Click on the photo to view (a little over a minute long) video. The whole fireworks show was 40 minutes long. Because the winds were southerly, I could even smell the smoke from the fireworks! Anyway, it was nice to be able to view them without having to deal with the crowds. Today, the winds are krazy strong but still very very humid and warm. We're expecting some cooler (non-humidity) temps over the next couple of days but after that, the temps are forecast to go up again...eep! This time of year there are many fireworks shows. Saturday night they had a fireworks show near Odaiba. 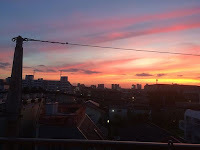 Odaiba is a man-made island near Shinagawa, which is near to where we live. 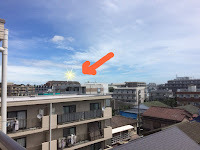 I checked the position of the fireworks show and compared it to where our apartment is. Luckily we could see the ones that got up higher than the building in this photo from our east balcony. Tonight is supposed to be the fireworks show for our ward. 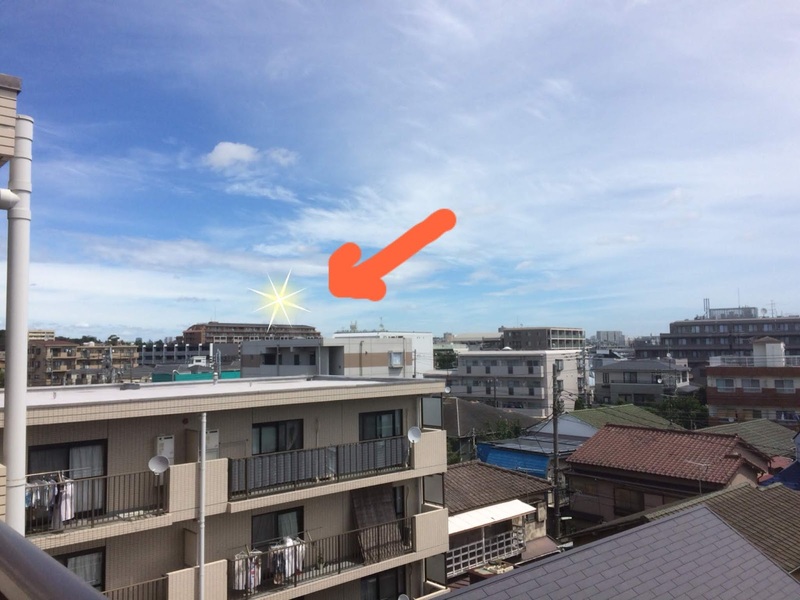 Hopefully we'll be able to see it from one of our two balconies. I think these berry tomatoes were from Hokkaido. They kind of looked like scotch bonnet peppers, so I made sure to re-read the sign at the market. I'm glad we got to try these, they were super sweet. 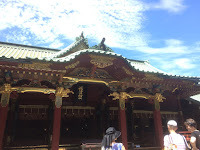 Saturday, it was blazing hot and humid. Satoshi's been studying for a test, so I decided to get out and about. 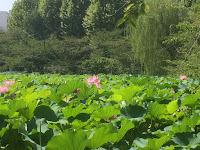 I don't know how I found out about the lotus flowers at Shinobazu Pond in Ueno, but I decided to check it out. Click on the photo to view the video. The southern area of the pond is called "Lotus Pond" and is filled with lotus plants and flowers. 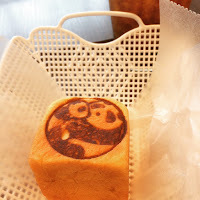 Since I was near the Ueno Zoo, I stopped in to get cooled off and to try panda stamped anpan from Wholesome Bakery. 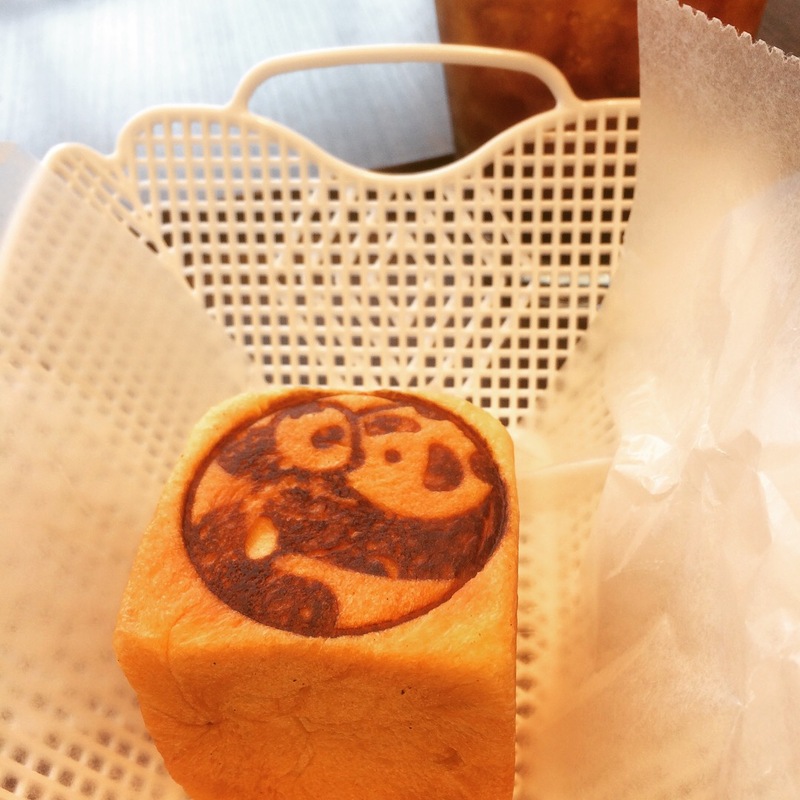 Last year, the panda at the Ueno Zoo gave birth, so they've been celebrating with all sorts of panda goods. The anpan was a brioche bread filled with sweet bean paste. With an iced coffee, it hit the spot. Then I headed to Ginza. I wanted to check out the Hiroshima Antenna Shop, boy! was it hard to find. 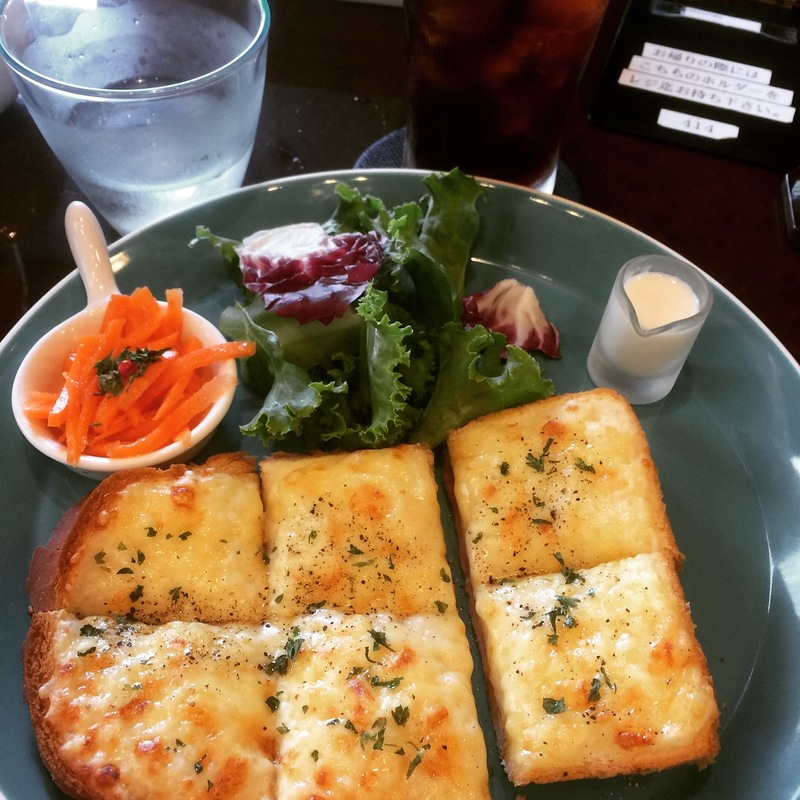 It was getting close to lunch time so I popped into Oslo Coffee and ordered their croque monsieur. The sandwich was oozy and delicious. Again, it was nice to cool off and take a break. 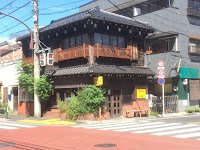 My last stop was Ginza Six, a relatively new building filled with shops and eateries. I wanted something sweet so I tried Philippe Conticini's citrus parfait. Super refreshing with all the different citrus used. 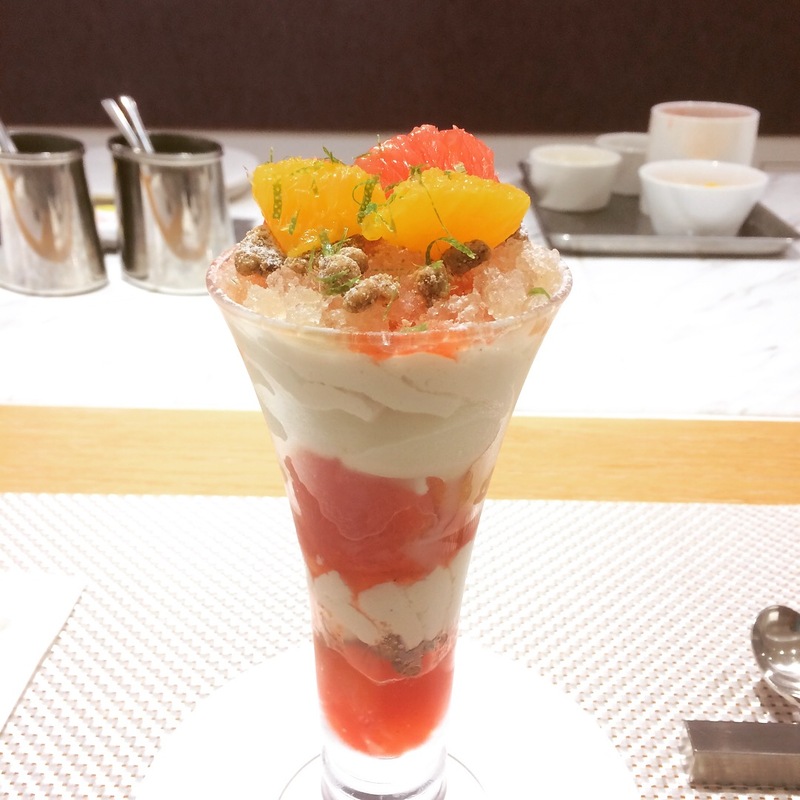 It was fun watching them make the parfait right in front of you too. It's still brutally hot and humid. Still, it was nice getting out and about. Click on the photo to see some of the things I brought back from my mom's kitchen. Sorry the video is kinda shaky and really short. 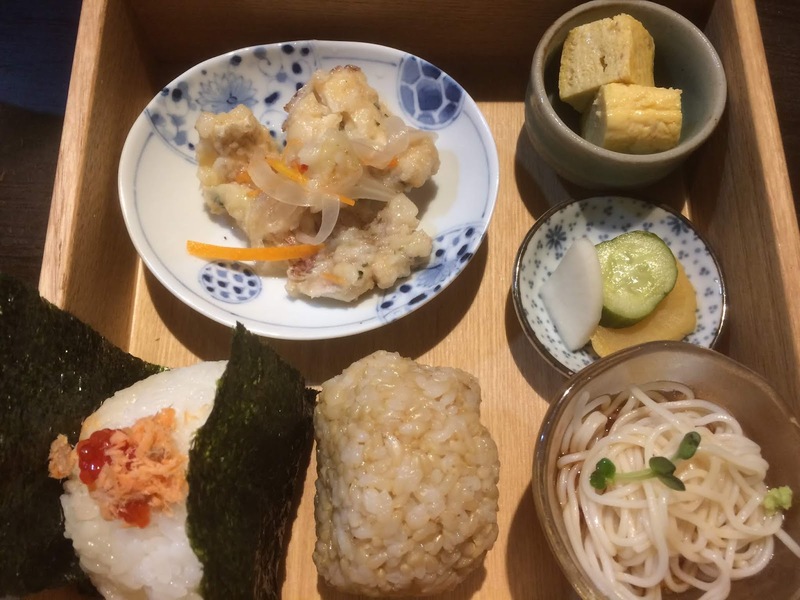 ...an oil screen, oil guard, oshizushi (pressed sushi) mold, long oshizushi mold, grater and tofu drainer. If you want to know at what stage of the season the fruits or veggies are in Japan, look at where it was grown. 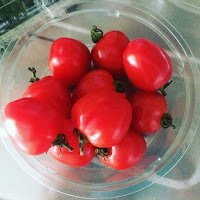 For example you will see most fruit & veggies start from Kyushu (where it is technically warmer) then make its way up all the way to Hokkaido. Of course, there are some fruits and veggies that are only grown in certain areas of Japan, so this tidbit wouldn't apply. 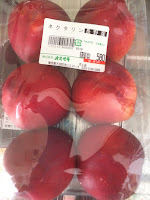 Anyway, these peaches which were grown in Fukushima Prefecture which means that the peach season is nearing the end. These blueberries were grown in Nagano, so I think the season is also coming to an end. We'll try these in the coming days, hopefully they won't disappoint. UPDATE: the peaches were on the firmer side but sweet and delicious. 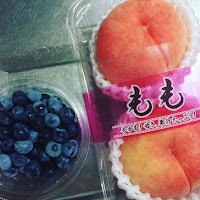 The blueberries were a little tart but delicious too. I should talk about the humidity and heat more often. This morning it was 71F/22C and no humidity! I had to convince Satoshi to bring a light sweater to work. Changing the subject, apparently, it's been 4 years since MOS burger had their naan taco. It seemed a little smaller than in the past, but was still delicious. You should've seen the TSA line in Honolulu, it snaked around a couple of times and went all the way to the curb! They finally have free wifi and have changed the gate numbering. 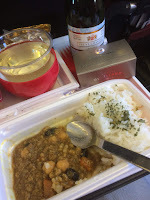 The menu on my flight was keema curry or oyster chicken. I chose the keema curry and it was pretty good. We also had fried fish (I think) with some marinated onions which was delicious too. The grossest thing on the tray was the potato salad which had a weird texture so I didn't eat it. We also received Big Island Candies cookies and Tropilicious sherbert. The flight also wasn't too full so the seat next to me was empty. I watched many movies...."Zootopia", "Coco" (I only saw the last half because I fell asleep after lunch), "Moana" and "The Greatest Showman". Mostly animation type movies, but I enjoyed all. Since Satoshi couldn't meet me at the airport, I sent one bag to be delivered. It was weird trying to remember how to get back to where we live. I guess I haven't really adjusted to the move yet. My bag was delivered yesterday and everything seems to be intact. The heat and humidity are brutal. Most of the plants on my lanai are dead...sigh. Our kitchen is the only place with the air conditioner, so we also are using our electric fan. I guess it doesn't help that a typhoon is also approaching. I haven't been meeting up with too many friends this trip back because I really didn't know what kinds of things I would need to get done regarding my Dad's estate. If you've been following us on Instagram or Facebook though, you know I have been eating. Thankful that BFF Wen, lives pretty much down the hill from me, so we would often go out to eat, talk story or just go holo holo (galavant). I did get a chance to meet up with Rex, my Flickr friend. Last year Rex and I met up at Ono Hawaiian Foods because it was closing. 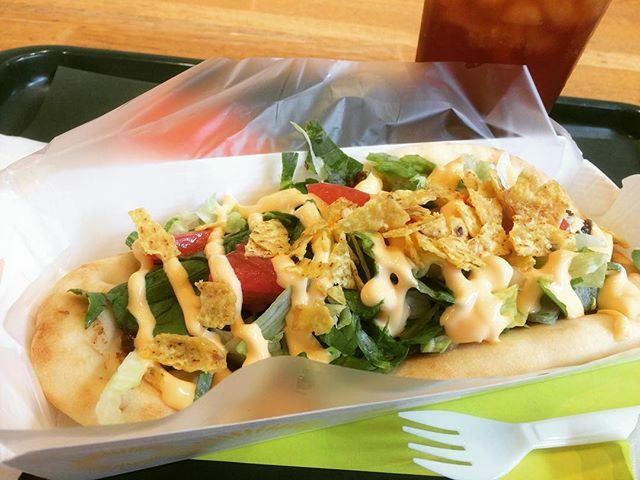 Almost every summer, we've planned to meet at W & M, but something or other has us eating elsewhere. We were all set to meet at W & M and Rex messaged me on Monday that he had mistaken the day so if I could meet up on Tuesday instead of Thursday. I messaged him back and told him W & M is closed on Tuesdays. He then explained that he needs to be in downtown after lunch for a photo shoot, so if I could pick somewhere near there. I thought about the parking downtown and SALT at Kaka'ako came to mind. 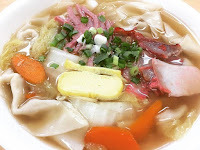 Then as I was looking at the different eateries online, Highway Inn popped out at me. I had remembered him saying that he liked the food there, so I asked if we could meet there. 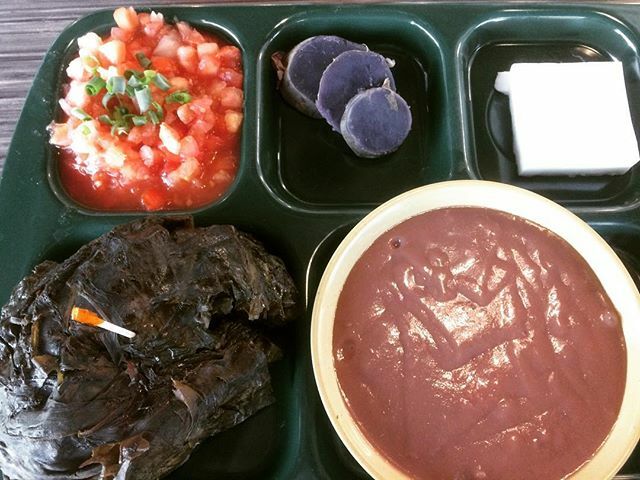 Actually, I'd never eaten there because like my Ono Hawaiian Foods post, our family usually made our own lau lau and other Hawaiian foods, rarely did we go out to eat it. The chicken lau lau was HUGE and filled with tender chicken, a piece of salted fish and lots of luau leaves (the leaves of the taro plant). 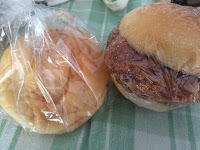 The other mains to choose from were beef or tripe stew, kalua pig or pork lau lau. The plate also came with choice of lomi lomi salmon, mac salad or tossed salad. Choice of rice or poi. 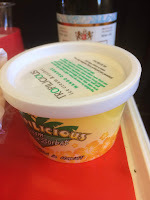 Sweet potato and haupia (coconut pudding). 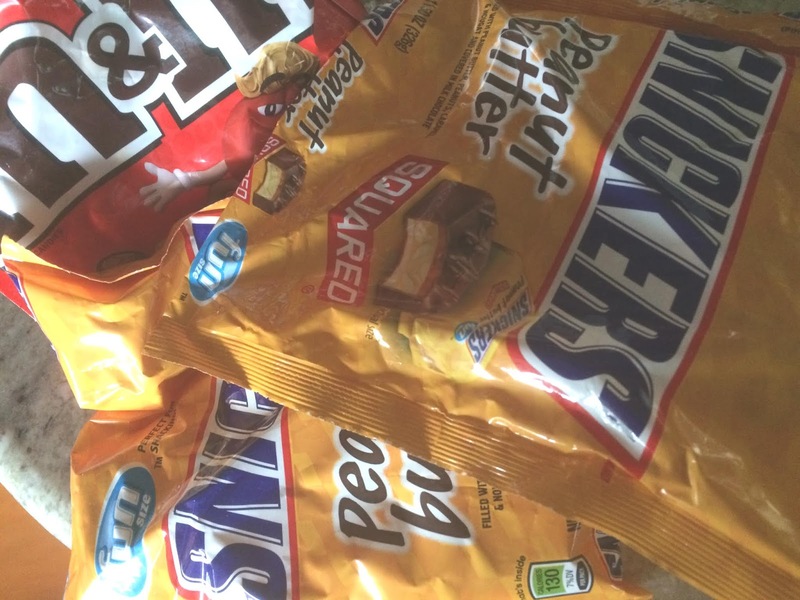 And if you were even hungrier, you could add on more items...eep! I loved the school lunch trays! I couldn't finish everything, so I'm glad they had take out boxes. It was nice meeting up. Before meeting up with Rex, I went to Punchbowl, to visit my grandpa's brother, a non-related "uncle" and I also went to see my Dad. 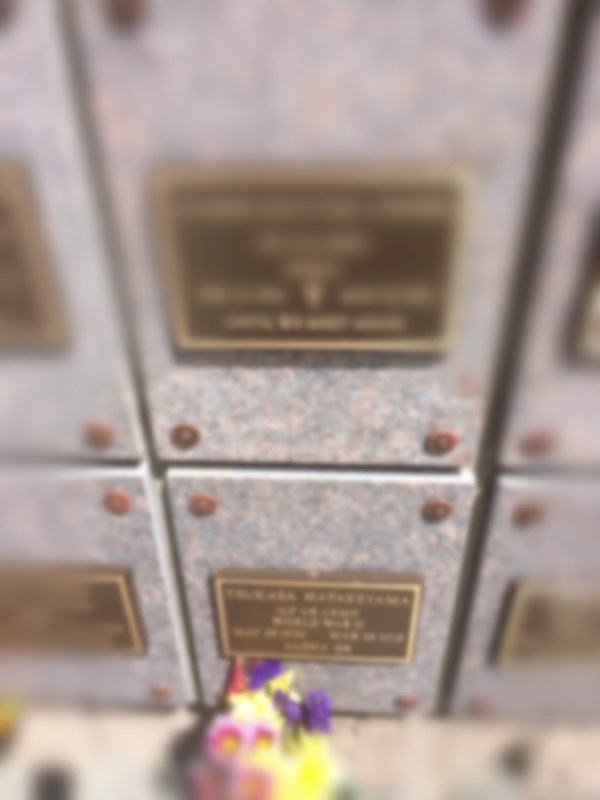 The plaque for his niche was up (they had mentioned before the interment that it may take up to 60 days), I'm glad I got to see it. It's been a long yet short 8 weeks. My brother intends to move back to the mainland and sell my parents house sometime next year. Which is why there were so many danshari posts, though we have so much more stuff to go through. I do hope he will change his mind and stay in Hawaii a little longer though. Thankful for all the love from family and friends (both virtual and those in real-life). By the time this posts, I should be back in Japan. Random things...Bringing back a family sized bag of PB M & M's and 3 fun sized bags of PB Snickers. This "should" last me until me next summer. 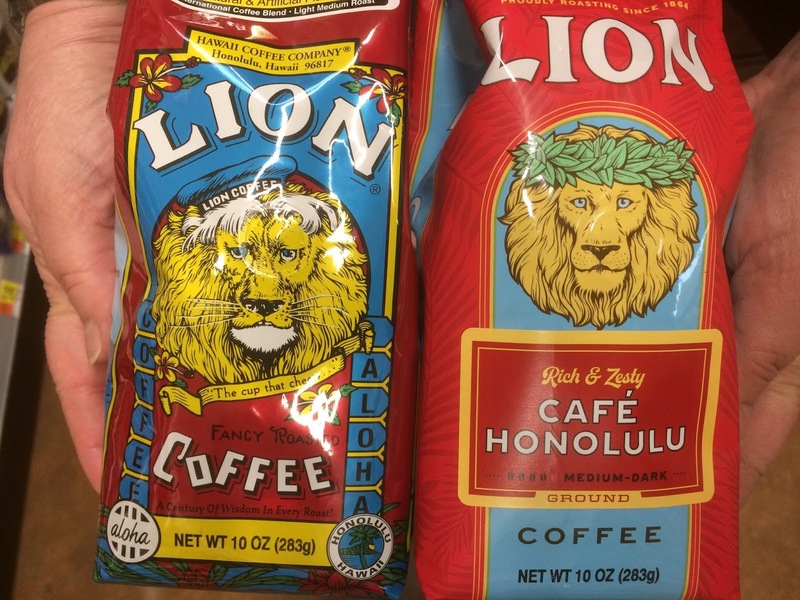 Kinda bummed that Lion Coffee changed their bags from the one on the left to the one on the right. 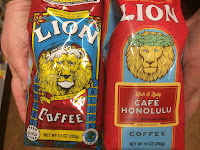 I'm biased because I used to work at Lion back in the day, but to me the bag on the right looks really cheap. 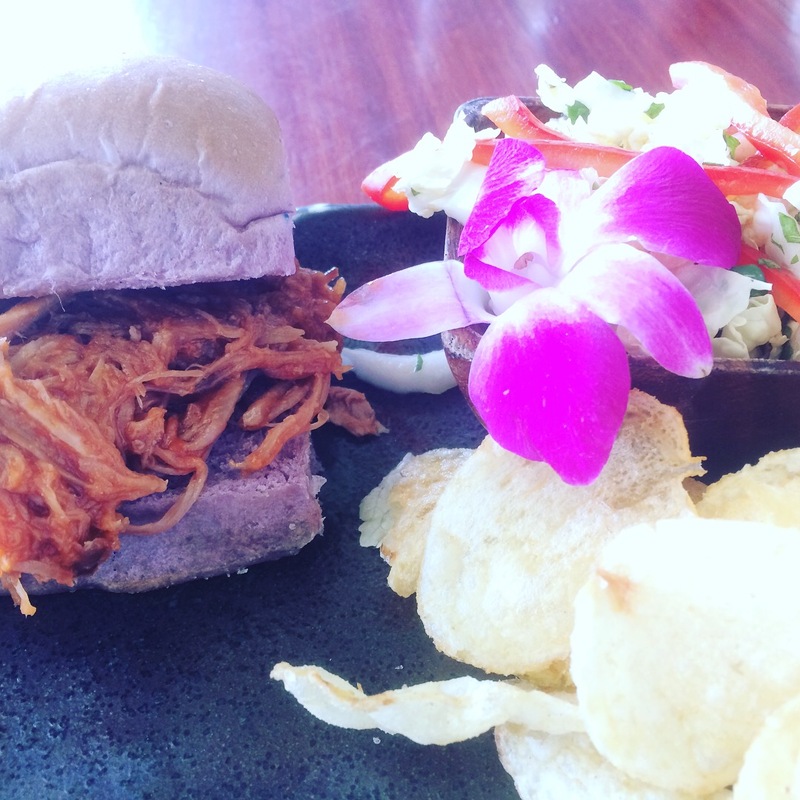 Lunch at Haleiwa Joe's with Aunty Merle. The asian slaw could've been marinated more, but it was nice spending some time with my Aunty...Thank you Aunty! Wun Tun Min with BFF Wen at Shiro's. Simple and delicious saimin...Thank you Wen. Crab Cake Salad at Nico's Pier 38 with relatives. 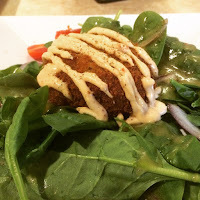 This was tasty but I thought the plating was kinda sad looking...in the middle of a huge plate of spinach was this one lonely crab cake with some halved cherry tomatoes scattered on the edges. Two or three teeny crab cakes and/or maybe a different kind of greens and/or variation of more veggies would've made this look more appetizing to the eyes...Thank you Uncle and Aunty!